Antoine Laumet de la Mothe, sieur de Cadillac (/ˈkædɪlæk/, French: [kadijak]; March 5, 1658 – October 16, 1730), usually referred to as Antoine de la Mothe Cadillac (also spelled Motte), was a French explorer and adventurer in New France which stretched from Eastern Canada to Louisiana on the Gulf of Mexico. He rose from a modest beginning in Acadia in 1683 as an explorer, trapper, and a trader of alcohol and furs, and he achieved various positions of political importance in the colony. 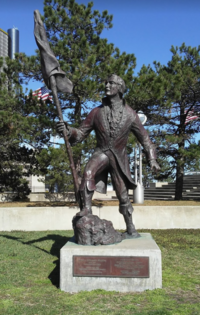 He was the commander of Fort de Buade in St. Ignace, Michigan in 1694. In 1701, he founded Fort Pontchartrain du Détroit which became the city of Detroit, which he commanded until 1710. Between 1710 and 1716, he was the governor of Louisiana, although he did not arrive in that territory until 1713. His knowledge of the coasts of New England and the Great Lakes area was appreciated by Frontenac, governor of New France, and Pontchartrain, Secretary of State for the Navy. 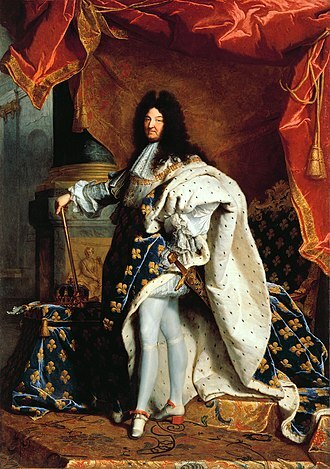 This earned him various favors, including the Order of Saint Louis from King Louis XIV. 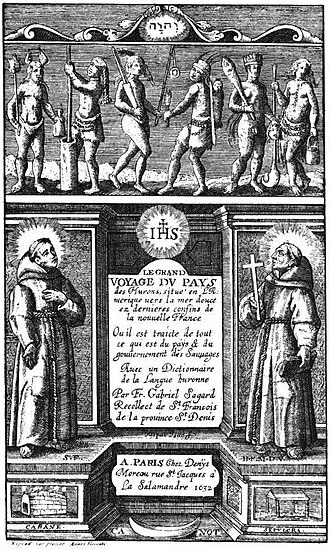 The Jesuits in Canada, however, accused him of perverting the Indians with his alcohol trading, and he was imprisoned for a few months in Quebec in 1704, and again in the Bastille on his return to France in 1717. 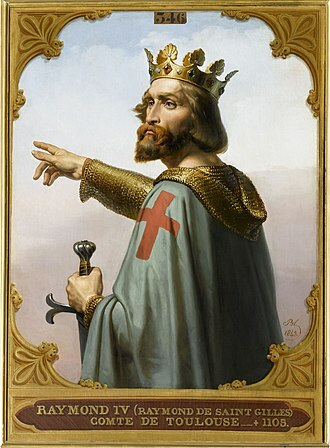 Upon his arrival in America, La Mothe adopted his title after the town of Cadillac, Gironde in southwestern France. The city of Detroit became the world center of automobile production in the 20th century. William H. Murphy and Henry M. Leland founded the Cadillac auto company and paid homage to him by using his name for their company and his armorial bearings as its logo in 1902. Various places bear his name in America, in particular Cadillac Mountain in Maine and the town of Cadillac, Michigan. He was widely hailed as a hero until the 1950s and the rise of liberal scholarship, but more recent writers have not admired him. 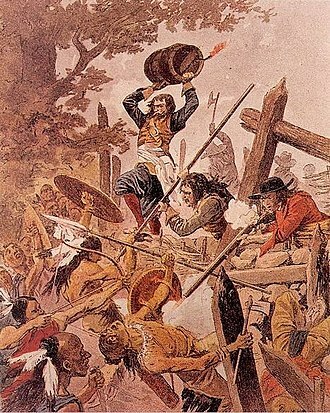 Zoltvany claims that "he most definitely was not one of the 'great early heroes' and probably deserves to be ranked with the 'worst scoundrels ever to set foot in New France'." Cadillac was born Antoine Laumet on March 5, 1658, in the small town of Saint-Nicolas-de-la-Grave in the French Province of Gascony (today in the Tarn-et-Garonne département of the Occitanie administrative region). His father, Jean Laumet, was born in the village of Caumont-sur-Garonne (Occitania). He became a lawyer in the Parliament of Toulouse. In 1652 Jean was appointed lieutenant to the judge of Saint-Nicolas-de-la-Grave by Cardinal Mazarin. He was appointed as a judge in 1664. Antoine's mother, Jeanne Péchagut, was the daughter of a merchant and landowner. La Mothe's adult correspondence reveals that his youth included rigorous study at a Jesuit institution where he learned theology, the law, agriculture, botany and zoology. In a record of service he filled out in 1675, he said that he had enlisted in the military as a cadet at the age of 17 in the Dampierre regiment, in Charleroi, nowadays Belgium. Two years later in personal letters, however, he reported that he had been an officer in the Clérambault regiment in Thionville, and in 1682 he had joined the Albret regiment, in Thionville. At the age of 25, Antoine Laumet departed from France to the New World. His father lost a lawsuit against a lawyer in Castelsarrasin that caused him financial difficulties. In addition, he had lost financial support following the death of Cardinal Mazarin and suffered the current intolerance against Protestants. Laumet may have embarked on his voyage by devious means, as historians have not found his name on any passenger list of ships departing from a French port. In 1683, Antoine Laumet arrived at Port Royal, the capital of Acadia. During the next four years, he explored his new country in all directions, extending his explorations to New England and New Holland, pushing south to the Caroline, now North Carolina and South Carolina, and learning some Native American languages and habits. He probably entered into a business relationship with Denis Guyon, a merchant of Quebec. 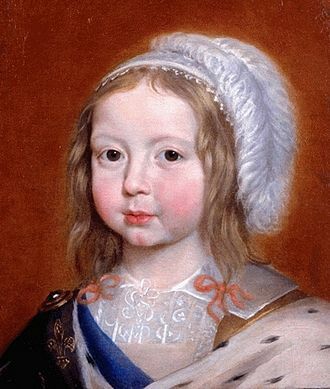 On June 25, 1687, he married Guyon's daughter, Marie-Thérèse, 17, in Quebec. The marriage certificate is the first document that records his new identity. He identified as "Antoine de Lamothe, écuyer, sieur de Cadillac", and signed as "De Lamothe Launay". Like many immigrants, he took advantage of emigrating to the New World to create a new identity, perhaps to conceal the reasons that drove him from France. This new identity "ne sort pas de son sac" ("I did not create this identity out of nowhere"), as he wrote later. Antoine Laumet likely remembered Sylvestre d'Esparbes de Lussan de Gout, baron of Lamothe-Bardigues, lord of Cadillac, Launay and Le Moutet; adviser to the Parliament of Toulouse. He knew him for at least two reasons: Bardigues, Cadillac, Launay and Le Moutet are villages and localities close to his birthplace, Saint-Nicolas-de-la-Grave, and Antoine's father Jean Laumet was a lawyer in the Parliament of Toulouse. The sons likely encountered each other during their studies. Second son in his family, Laumet identified with the second son of the baron. He used the phonic similarity between his own name and that of Launay, creating the name: Antoine de Lamothe-Launay. He took the title of écuyer (squire), the rank held by a family's second son, followed by the title sieur (sire) of Cadillac. This accorded with the Gascon custom whereby the junior family member succeeds the elder son upon the latter's death. Laumet created a new name, identity and noble origin, while protecting himself from possible recognition by persons who knew him in France. In addition, he presented his own titles of nobility, as illustrated by armorial bearings that he created by associating the shield with the three « merlettes » (birds with no legs or bill) of the baron de Lamothe-Bardigues and that of the Virès family (of France's Languedoc region). The marriage proved to be a fertile one. 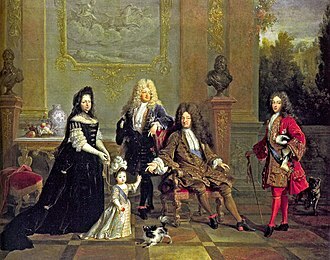 The Lamothe-Cadillac couple had six daughters and seven sons: Judith (1689), Magdeleine (1690), Marie Anne (1701), ? 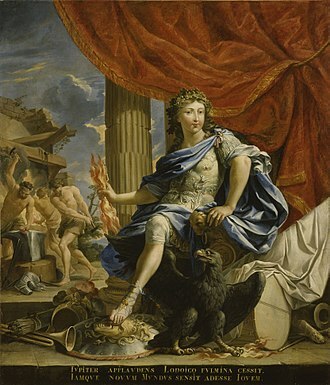 (1702), Marie-Thérèse (1704), Marie-Agathe (December 1707) and Joseph (1690), Antoine (1692), Jacques (1695), Pierre-Denis (1699–1700), Jean-Antoine (January 1707–1709), François (1709), René-Louis (1710–1714). In 1688, the governor Jacques-René de Brisay de Denonville gave him the concession of the seigniory (estate) of Les Douacques (which later became the town of Bar Harbor, Maine, well known today as a tourist town, but then for fishing and lobsters). His concession brought him no income, even from agriculture. Lamothe entered into a trading partnership with officers of Port Royal, an activity facilitated by using a ship owned by his brothers-in-law Guyon. In 1689, he was sent on an expedition in the vicinity of Boston. Upon his return, he asked the governor of Acadia, Louis-Alexandre des Friches de Méneval, for a job as notary, to bring in a minimum income; his request was turned down. Then, Cadillac was introduced to the governor Louis de Buade de Frontenac in Quebec, who sent him on an exploratory mission along the coasts of New England, aboard the frigate L'Embuscade (The Ambush). Strong head winds forced the ship to return to France. In 1690, Cadillac was in Paris. He became part of the circle of the Secretary of State for the Navy, the marquis de Seignelay, then of his successor Louis Phélypeaux, comte de Pontchartrain, who appointed him officer of marine troops. On his return to Port Royal, LaMothe learned that the English admiral William Phips had seized the city, and that his wife, daughter, and son were being held captives. They were released in exchange for some English prisoners. In 1691, Cadillac repatriated his family to Quebec, but their ship was attacked by a privateer out of Boston, who took possession of all their goods. Cadillac was promoted to lieutenant in 1692. He was sent with the cartographer Jean-Baptiste-Louis Franquelin to draw charts of the New England coastline in preparation for a French attack on the English colonies. He set out again for France to hand over the charts, together with a report, to the Secretary of State Pontchartrain. In 1693, he got an allowance of 1500 pounds for his work and was sent back on a further mission to supplement his observations. Frontenac promoted him to captain, then lieutenant commander in 1694. Cadillac was appointed commander of all the stations of the Pays d'En-Haut (the upper countries). He left France at the peak of his career to take up his command of Fort de Buade or Michilimackinac, which controlled all fur trading between Missouri, Mississippi, the Great Lakes, and the Ohio valley. Cadillac gave his wife power of attorney to sign contracts and notarize documents in his absence. In 1695, Cadillac traveled to explore the area of the Great Lakes and to draw up charts. He had the idea of starting a fort in the straits between Lakes Erie and Huron to compete with the English. 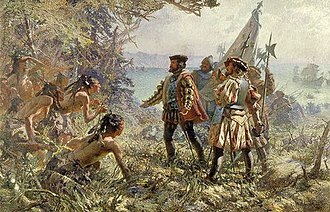 In Michilimackinac, he came into conflict with the Jesuit fathers, such as Étienne de Carheil, who accused him of supplying alcohol to the Indians. This was prohibited by a royal decree. In 1696, to mitigate the difficulties of fur trading, the king ordered the closing of all trading posts, including Michilimackinac. Cadillac returned to Montreal. In 1697, he was authorized to return to France to present his project of a new fort on the strait to the Secretary of State Pontchartrain; Frontenac requested that he be promoted to lieutenant commander. 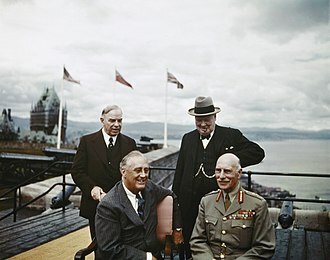 However, Canadian notables strongly opposed the project which, they believed, would lead to the ruin of Quebec and Montreal. Only in 1699 did Cadillac get the support of Pontchartrain to implant the new fort; this was authorized in 1700 by the king, who entrusted its command to Cadillac. 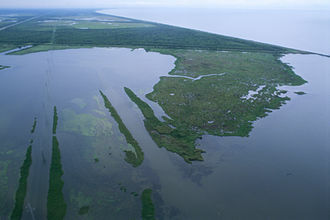 On July 24, 1701, Antoine de La Mothe-Cadillac founded Fort Pontchartrain and the parish of Sainte-Anne on the straits ("le détroit " in French). He was helped by Alphonse de Tonti. Their wives joined them in October. In 1702, Cadillac went back to Quebec to request the monopoly of all fur-trading activities and the transfer to his authority of the Amerindian tribes in the area of the straits. He became a shareholder in the "Company of the Colony." After return to the straits, he helped in welcoming and settling the native tribes formerly installed at Michillimakinac. A fire devastated Fort Pontchartrain in 1703. This disaster destroyed all the registers and records. Cadillac was recalled to Quebec in 1704 to face charges of trafficking in alcohol and furs. Although he was imprisoned as a preventive measure for a few months, his name was cleared in 1705. The king guaranteed him all his titles and granted him the fur-trading monopoly he sought. Two years later, Cadillac was charged with multiple counts of abuse of authority; Pontchartrain appointed a representative, Daigremont, to investigate. He formulated an indictment against Cadillac in 1708. 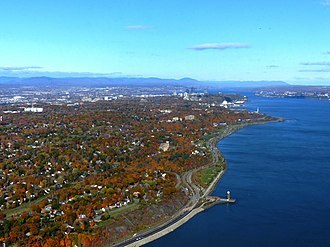 In 1709, the troops stationed on the straits were given the order to return to Montreal. In 1710, the king named Cadillac governor of La Louisiane, the expansive Louisiana (New France) territory, and ordered him to take up his duties immediately, traveling via the Mississippi River. 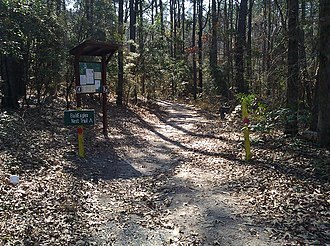 A historical marker that reads: This tablet marks the site of the first lead mine opened in the Mississippi Valley about the year 1700. 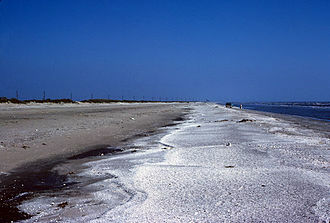 It is named for Antoine De LaMotte Cadillac, governor of Louisiana 1710–1717. Cadillac did not obey. He drew up a general inventory of the straits, and then, in 1711, boarded a ship, with his family, bound for France. In Paris, in 1712, he convinced the Toulouse-born financier Antoine Crozat to invest in Louisiana. 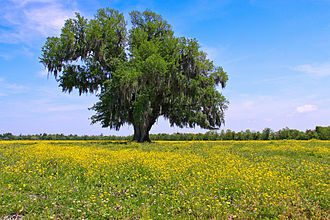 In June 1713, the Cadillac family arrived at Fort Louis, Louisiana (now Mobile, Alabama), after a tiring crossing. In 1714, Crozat recommended the construction of forts along the Mississippi River, whereas Cadillac wished to strengthen defenses at the mouth of the River and to develop trade with nearby Spanish colonies. 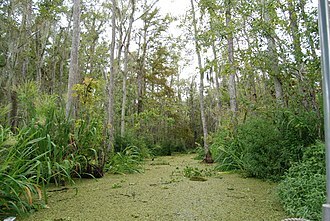 In 1715, Cadillac and his son Joseph prospected in the Illinois Country (Upper Louisiana), where they claimed to have discovered a copper mine, although there is no copper ore in that area. They established a farm and founded the settlement of St. Philippe on the east side of the Mississippi River. Cadillac directed the first mining of lead in present-day Missouri at what is now called Mine La Motte on the west side of the river. The French brought in slaves to work at the mine; they were the first people of African descent in the future state of Missouri. The production of lead was important for ammunition in the colonies. The Southeast Missouri Lead District is still a major source of that metal. After many arguments, Crozat withdrew any authority Cadillac had in the company. The following year, he ordered Cadillac removed from colonial office. The Cadillac family returned to France and, in 1717, settled in La Rochelle. Cadillac went to Paris with his son Joseph. They were arrested immediately and imprisoned in the Bastille for five months. They were released in 1718, and Cadillac was decorated with the Order of Saint Louis to reward his 30 years of loyal services. He settled in the paternal home, where he dealt with his parents' estate. 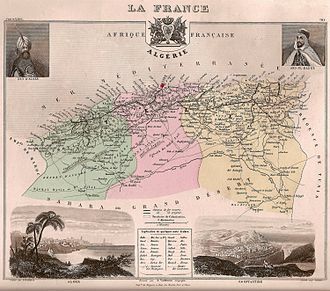 He also made many trips to Paris to have his rights to the concession on the straits recognized. He prolonged his stay in Paris in 1721, giving another general power of attorney to his wife to sign documents in his absence. He was finally vindicated in 1722. 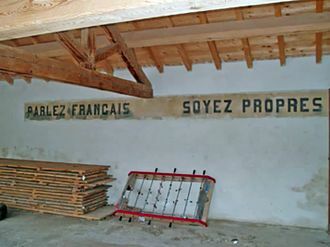 He sold his estate on the straits to Jacques Baudry de Lamarche, a Canadian. The French government appointed Cadillac as governor and major of Castelsarrasin, close to his birthplace. Antoine de Lamothe-Cadillac died on October 16, 1730 in Castelsarrasin (Occitanie), "around the midnight hour", at the age of 72. He was buried in a vault of the Carmelite Fathers' church. Some of Antoine de Lamothe-Cadillac's far-reaching visions were developed after he had left New France. For instance, Jean-Baptiste Le Moyne de Bienville founded the city of New Orleans, near the mouth of the Mississippi River, in 1718, and it became a major port and city of New France. The straits became a strategic location. Fort Pontchartrain du Détroit enjoyed an ideal location between the Great Lakes and the river basins. The fort would be succeeded by Fort Detroit and Fort Wayne and by Fort Amherstburg and Fort Malden on the opposite shore. The car brand Cadillac was named after him, and its headquarters was in Detroit (it has since been moved to New York City), where Cadillac himself explored. Antoine de la Mothe Cadillac was honored with a 3-cent stamp on July 24, 1951, to commemorate the 250th anniversary of his landing at Detroit in 1701. The stamp's background design depicts Detroit's skyline as it appeared in 1951 and the foreground shows Cadillac's landing at Detroit in 1701. On 20 April 2016, the public French high school in Windsor, Ontario was renamed in Cadillac's honour. On the green line of the Montreal Metro, Cadillac is named in honor of him. ^ William Pelfrey (2006). Billy, Alfred, and General Motors: The Story of Two Unique Men, a Legendary Company, and a Remarkable Time in American History. AMACOM. p. 70. ^ Zoltvany. "Laumet, dit de Lamothe Cadillac, Antoine,"
^ Lovell, Jeffrie H.,"Landing of Cadillac Issue", Arago: people, postage & the post, National Postal Museum. Viewed March 22, 2014. Fort Pontchartrain du Détroit or Fort Detroit was a fort established by the French officer Antoine de la Mothe Cadillac in 1701. The site of the fort is now within the city of Detroit in the U. S. state of Michigan, an area bounded by Larned Street, Griswold Street. Cadillac ordered Fort Detroit built on the Detroit River to try to keep the British from moving into the west, before he built Fort Detroit, Cadillac was commandant of Fort de Buade, another French outpost in North America. Fort de Buade was abandoned in 1697 due to conflicts with religious leaders over the trading of alcohol to the Native Americans, Cadillac persuaded his superiors to let him build a new settlement. He reached the Detroit River on July 23,1701, when he landed on the site, he held a celebration to formally take control of the area. In honor of Louis Phélypeaux, Comte de Pontchartrain, Minister of Marine to Louis XIV, the storehouse and the stockade were started immediately, but the first building completed was Ste. The stockade came next and was made of logs with defensive bastions or towers in each corner, after the fort was established, some Ottawa and Huron moved into the area for the convenience of trading with the French. The first major conflict of Fort Detroit occurred in March 1706 while Cadillac was away, the Ottawa heard a rumor about a Huron tribe ambush. 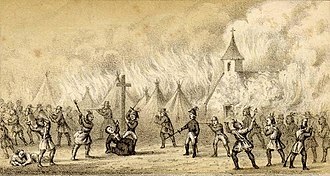 The Ottawa attacked and killed members of the Miami tribe. 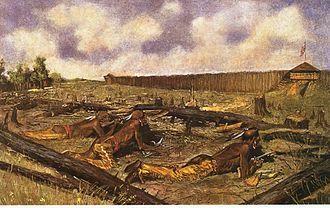 The Miami sought safety in the fort, where they were defended by the soldiers, the French killed about 30 Ottawa warriors when they attacked the fort. 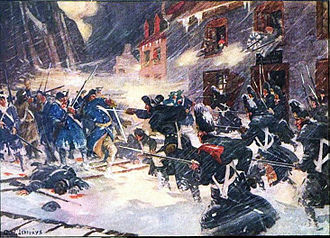 After the battle, the Miami attacked an Ottawa village, in the conflict a French priest and sergeant were both caught outside the walls and killed. The fort was commanded by Étienne de Veniard, Sieur de Bourgmont, Bourgmont was criticized for his handling of the incident. When Cadillac returned and some soldiers from the fort deserted, the French captured one of the deserters, who testified that the deserting party had shot and killed one of its own and cannibalized him. Philip A. Hart Plaza in downtown Detroit, is a city plaza along the Detroit River. It is located more or less on the site at which Antoine Laumet de La Mothe, sieur de Cadillac landed in 1701 when he founded Fort Pontchartrain du Détroit, the 14-acre plaza, which is named for the late U. S. Senator Philip Hart, opened in 1975 and has a capacity for about 40,000 people, at the center of the plaza is the Horace E. Dodge and Son Memorial Fountain, designed by Isamu Noguchi and Walter Budd in 1978. The area where Hart Plaza stands today is believed to be where Antoine Laumet de La Mothe, the waterfront area became the main source of communication and transportation to the outside world until the inventions of the railroad and telegraph. By the mid 19th century this area was covered by docks, warehouses and it wasnt until 1890 that Hazen S. Pingree, Detroits mayor at that time, suggested the location would be ideal for the creation of a waterfront center for city functions. 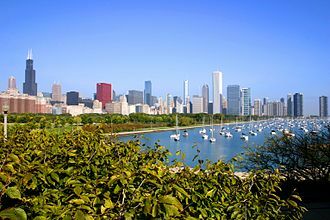 However, the project was not carried through, in 1924, the architect Eliel Saarinen was commissioned by the AIA of Michigan to compose a waterfront civic center design. However, World War II got in the way of its development, the first parts to go up in the area were the buildings, including a veterans hall, an auditorium, and the city-county building. Finally, it came to the creation of what is now Hart Plaza, what was created was a departure from Saarinens original design, which was originally to be a grassy lawn area. It was decided to build the current concrete plaza instead, with built in amphitheaters for concerts. The final design was done by the firm of Smith, the plaza opened in 1975 and in 1976 was dedicated to Philip Hart, a United States Senator from 1959 to 1976. However, the park was not completed until 1979, on the citys 300th birthday — July 24,2001 - a statue was unveiled depicting Antoine Laumet de La Mothe, sieur de Cadillac arrival at what would become Detroit in 1701. On October 20,2001, the Gateway to Freedom International Memorial to the Underground Railroad opened — commemorating Detroits role in the Underground Railroad and it was sculpted by Edward Dwight, after winning a competition to design the International Memorial to the Underground Railroad. Bar Harbor is a town on Mount Desert Island in Hancock County, United States. As of the 2010 census, its population is 5,235, Bar Harbor is a popular tourist destination in the Down East region of Maine and home to the College of the Atlantic, Jackson Laboratory, and MDI Biological Laboratory. Prior to a catastrophic 1947 fire the town was a summer colony for the super-affluent elite. Bar Harbor is home to the largest parts of Acadia National Park, including Cadillac Mountain, the highest point within twenty-five miles of the coastline of the Eastern United States. The town is served by the Hancock County-Bar Harbor Airport, which has flights on Cape Air and PenAir to Boston, as well as flights to Newark and Portland. The town of Bar Harbor was founded on the northeast shore of Mount Desert Island, the Wabanaki seasonally fished and gathered berries and other shellfish in the area. They spoke of Bar Harbor as Man-es-aydik or Ah-baysauk, leaving piles of shells as evidence of this abundance. In early September 1604, French explorer Samuel de Champlain ran aground on a rock ledge believed to be just off Otter Cliffs, Champlain named the island Isles des Monts Deserts, meaning island of barren mountains—now called Mount Desert Island, the largest in Maine. The community was first settled by Europeans in 1763 by Israel Higgins and John Thomas and incorporated on February 23,1796 as Eden, after Sir Richard Eden, early industries included fishing and shipbuilding. With the best soil on Mount Desert Island, it developed agriculture, in the 1840s, its rugged maritime scenery attracted the Hudson River School and Luminism artists Thomas Cole, Frederic Edwin Church, William Hart and Fitz Henry Lane. Inspired by their paintings, journalists and rusticators followed, agamont House, the first hotel in Eden, was established in 1855 by Tobias Roberts. Birch Point, the first summer estate, was built in 1868 by Alpheus Hardy, by 1880, there were 30 hotels, including the Mira Monte Inn, a historic landmark that would survive a massive fire, in 1947. Tourists were arriving by train and ferry to the Gilded Age resort that would rival Newport, a glimpse of their lifestyles was available from the Shore Path, a walkway skirting waterfront lawns. Yachting, garden parties at the Pot & Kettle Club, others enjoyed horse-racing at Robin Hood Park-Morrell Park. Cadillac /ˈkædᵻlæk/, formally the Cadillac Motor Car Division, is a division of the U. S. -based General Motors that markets luxury vehicles worldwide. Its primary markets are the United States and China, Cadillac automobiles have always held a place at the top of the luxury field within the United States. In 2016, Cadillacs U. S. sales were 170,006 vehicles, Cadillac is among the oldest automobile brands in the world, second in America only to fellow GM marque Buick. The firm was founded from the remnants of the Henry Ford Company in 1902 and it was named after Antoine de la Mothe Cadillac, who founded Detroit, Michigan. The Cadillac crest is based on his coat of arms, by the time General Motors purchased the company in 1909, Cadillac had already established itself as one of Americas premier luxury carmakers. The complete interchangeability of its parts had allowed it to lay the foundation for the modern mass production of automobiles. It was at the forefront of advances, introducing full electrical systems, the clashless manual transmission. The brand developed three engines, with its V8 setting the standard for the American automotive industry and it won the trophy again in 1912 for incorporating electric starting and lighting in a production automobile. Cadillac was formed from the remnants of the Henry Ford Company, after a dispute between Henry Ford and his investors, Ford left the company along with several of his key partners in March 1902. Instead, Leland persuaded the pair to continue manufacturing automobiles using Lelands proven single-cylinder engine, a new company called the Cadillac Automobile Company was established on 22 August 1902, re-purposing the Henry Ford Company factory at Cass Street and Amsterdam Avenue. It was named after French explorer Antoine Laumet de La Mothe, sieur de Cadillac, Cadillacs first automobiles, the Runabout and Tonneau, were completed in October 1902. They were two-seat horseless carriages powered by a 10 hp single-cylinder engine and they were practically identical to the 1903 Ford Model A.